Willow Creek Farm has been a dream that was a long time coming. I would like to share the short version of the story with you. As a teen I was a horse-crazy farm-dreaming girl. I was not raised on a farm, but longed to have one. I did have a horse that we boarded and enjoyed spending every minute I could on the ranch with her. On my first day of high school my future began to unfold. As I walked toward the school building I saw a guy walking ahead of me. He was obviously an upper classman, and very handsome and I got butterflies in my stomach when I noticed him. As we neared the door to the school he opened it and then stood back, holding it open for me. The whole world slowed down, like in a movie, as I raised my face to say thank you. He was smiling and our eyes met. I saw a gentle-hearted, confidant, and kind young man and in that moment I knew I wanted to look into those eyes every day for the rest of my life. 5 years later I married that man, my high school sweetheart, who had turned out to be exactly what I thought he was that first day – a gentle-hearted, kind, and confidant man, and we began our journey together as husband and wife. We were in college at the time, I was focusing on Equine Science and getting my Therapeutic Riding Instructor Certification and he was in Construction Management. As we neared the end of college we purchased some property, and began dreaming of a family farm and building a house. Little did we know that it wasn’t time for us to live our dream yet. Right towards the end of building the house we were in a terrible car accident that changed our lives forever. We did live on that property, with a couple of horses, for a couple of years, but because of the results of the accident it never turned into what we dreamed of and we ended up moving to a small apartment. We were blessed over the years with five wonderful children and my focus became raising and home-schooling them. We moved two more times and ended up in a house with a nice back yard where we began teaching ourselves how to garden. In the two years we were there we learned a lot and built a very prolific vegetable garden which provided us fresh produce all summer. I then learned how to can, freeze, and preserve our garden produce so that it was feeding us all winter as well. Then came another move. This time we moved to a place where we would own over half an acre, with the house positioned far forward on the property, leaving plenty of space in the back for us to work closer to our dream of a family farm. When we purchased the place we were told the HOA had dissolved and we were allowed to have animals on the property, just not horses or cows. Right away we went to work putting in an even better vegetable garden than what we had at the last house. We made plans for meat rabbits, chickens, and dairy goats. We began learning how to raise rabbits first and we got our first three rabbits, two does and a buck. We had excellent success with our rabbits and were happy to be raising our own vegetables and meat. Next came chickens. My husband built a coop and pen that were like a vault – protecting the chickens from the many predators in our area. We got our first chicks – 11 Ameraucanas. Again, like the rabbits, we had excellent success and were enjoying the fresh eggs and beginning the plans for dairy goats when we found out our dream still wasn’t fully going to play out. It turned out the HOA was alive and well and that chickens were not allowed, nor were any other livestock. The neighbors that could see and hear our hens were happy with them and were even buying eggs from us, but it didn’t matter. At that same time I became very ill and again our life changed drastically. Due to my illness and the time it took from our lives we made the choice to get rid of the rabbits. We were able to continue with the garden though, and with preserving the harvest, with help from friends. After 18 months of illness I was finally healthy again and began rehabilitating my body and building up my energy and stamina to be able to live my normal life. About that time an opportunity to buy my childhood home came about. It had been neglected for years and was a fixer upper, but still it had tons of potential, was much bigger than our current house, and was situated on 3 acres zoned for any animals we wanted to have. It seemed our chance at our dream farm was within reach. The big mountain between us and it was the fact that the real estate market was dead in our area, houses were not selling well at all. But our realtor told us that houses in the price range we wanted to sell ours in were selling better than others, so there was hope. We sat on the idea for about 6 months until I was back to full health and normal life. I needed to be able to properly care for my kids and their needs fully before we would consider taking on the potential of a family farm. But I got to that point, so we decided to list the house for 6 months. If it sold, we would buy the place and build our dream farm, if it didn’t sell we would take it off the market and wait a few years and see what happened. Three months later we had a contract on our house and in a whirlwind 2 weeks we had moved to the new farm. At that time, it wasn’t a farm, just a mountain property with a house. But it didn’t take long to fix that! A few weeks later – much earlier than I had planned since we were still unpacking and settling in at the new place – we got our first livestock for the farm. On Mother’s Day my husband gave me a very surprising present…a beautiful, sweet, pregnant, milking Jersey cow! I had always wanted a Jersey cow (the reason we were planning to have goats at the other place was because we weren’t allowed a cow, but I really wanted a cow) and every year when we went to the county fair I would ooooh and aaaaah at the adorable doe-eyed Jersey’s and look at my husband with my own doe-eyes and he would smile and say, “Someday I will buy you one.” Well, “someday” had arrived! The breeder kept her for two weeks while we scrambled to put up some sort of pen and shelter, just enough to keep her safe. Then, after she moved to the property we continued to build the barn and make it nice for her. When we moved to the new property it was too late to build and plant a garden for that summer, since we have such a very short growing season. But it turned out fine because we were plenty busy learning how to milk and care for the cow and doing the necessary and imminent house fixes. As the summer progressed we continued to fix up the house for winter, and fix up the barn for winter and for the upcoming calving as well. We added a milking parlor, a hay storage area, electricity, and a stall and manger. And we began planning to get rabbits and chickens again. They joined the farm in the fall and wool sheep came a year later. We continued to fix up things and make it exactly what we want it to be. Early on, we decided it was time to name the farm – Willow Creek Farm was born. There is still SO much to do as we continue to build our dream of having a family farm. We are looking forward to it with much excitement. And we decided we wanted to share the journey with others. And so we started this blog. Update July 2016: I finally gave our family blog names! To meet our family, click here. 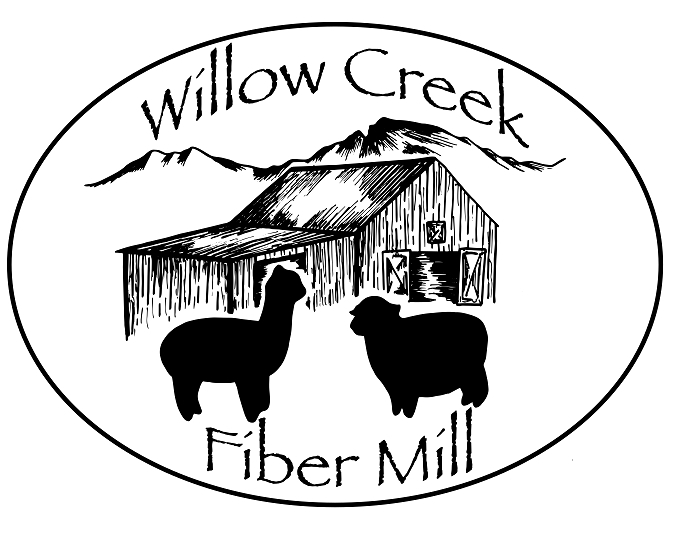 Update May 2017: We fulfilled another dream of ours and opened Willow Creek Fiber Mill! In asking for great homesteading sites I was given the name of your blog from one of your followers. One of my blog followers suggested I write a post that lists other homesteading sites in various areas, saying it would be helpful to readers to check out homesteading blogs in their own area as well, and I agree!! So I am about to publish a post on my own blog listing other homesteading blog pages for all regions, and I’d like to include your page. Would that be OK? If so, can you give me just a line or two that would best describe your location and blog topics? Willow Creek Farm is a small, backyard homestead located in the Rocky Mountains of Colorado where we raise and grow healthy food for our family while dealing with a short-season, high-altitude, rocky, and cold climate. Topics include high-altitude homesteading; raising sheep for wool, meat, and milk; chickens for meat and eggs; rabbits for wool and meat; dairy cows; multi-purpose backyard farm collies; growing, harvesting, and preserving fruits and vegetables; hunting and foraging in the Rockies; and more. Sorry! Our store just recently went offline, so it is no longer available. I need to remove the link. What an amazing story! I hope one day to purchase my own homestead/smallholding and will keep going until I get there. I’m a city girl who loves living vicariously! I think your story is amazing and congratulations on all you’ve been though and got done! I look forward to following. Happy to have stumbled upon your blog this morning, I’ll be back 🙂 Great back story, even if it hasn’t always gone smoothly, I’m happy you found your dream. Jonathan > Thanks for sharing your family story. It strengthens my resolve to through off the cynical worldliness that clouds the clear-sightedness of my own youth.